Benjamin Franklin Keith and Edward Franklin Albee became partners in the late 1880s to promote "polite" vaudeville. They lavishly remodeled several theaters on the east coast and began producing a brand of "high class" vaudeville. Crude remarks and risque costumes were censored from performances, and they even attempted to prohibit rude behavior by audiences. Keith was the financial head of the circuit, while Albee was the general manager and owner of several theaters. In 1906, Keith and Albee established the United Booking Office. Every act that sought employment at any of the member theaters had to work through this central office, which in turn charged a five percent commission per act. Thus Keith and Albee expanded their power base. In the 1920s the Keith/Albee circuit merged with a western chain of vaudeville theaters to form the Keith-Albee-Orpheum Circuit. In 1928, $4,500,000 worth of stock was sold to Joseph P. Kennedy's Radio Corporation of America (RCA) establishing the Radio-Keith-Orpheum (RKO). After this merger, motion pictures became the primary form of entertainment, while vaudeville survived only as an accompaniment to the feature film. The collection has been digitized in its entirety, and is viewable in the Iowa Digital Library. It is currently being transcribed and the content is increasingly full-text searchable in DIY History. The physical volumes are no longer accessible due to their extremely fragile condition. Please read The University of Iowa Libraries' statement on Property Rights, Copyright Law, and Permissions to Use Unpublished Materials. The history of this collection is not entirely recorded. It is said to have been discovered in the basement of The RKO Albee Theatre, Westminster Street, Providence, Rhode Island in the 1970s when this theater was being demolished. Richard Rand, a fire underwriter, found the records, took an interest in and acquired title to them either from the theater owners or the company tearing down the building. He moved them to a nearby warehouse. 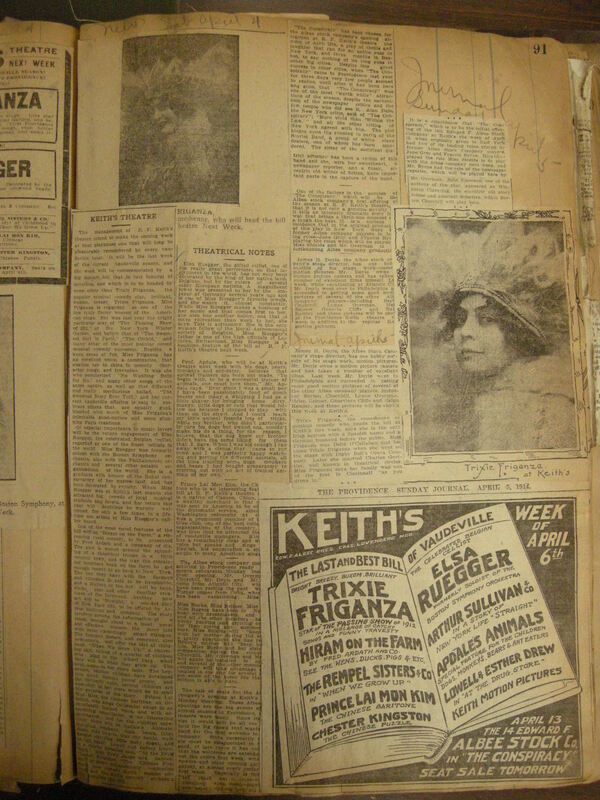 Some years later, Robert C. Allen, then a graduate student in The University of Iowa Speech and Dramatic Arts Department researching his dissertation on the relationship between vaudeville and film 1896-1915, learned of the records from a friend, sought out Rand while visiting Boston, and examined the records. Allen recalls that Rand planned to offer them piecemeal at auction but agreed to consider an offer from a library. On his return to Iowa City, Allen brought the collection to the attention of Frank Hanlin, then head of collection development in the Libraries. Hanlin, in turn, arranged to acquire the records in 1976. Acquisition records for purchased materials are generally destroyed after ten years, and that seems to have been the case here; we are not presently able to locate documentation for the purchase. Researchers owe Rand a generous round of thanks for preserving the records, however, and Allen and Hanlin a similar round for bringing them into the Libraries. We in turn thank Fred McLennan and Robert Allen for the information in this note. Series I, Manager's Reports (1903-1923), consists of 24 ledger books into which have been pasted 6056 typescript reports of weekly programs written by and circulated among circuit theater managers. To produce an adequate number of copies, a flimsy (tissue) paper was used; some reports are ribbon copies, others carbon copies; many run two or three pages (or portions of pages). 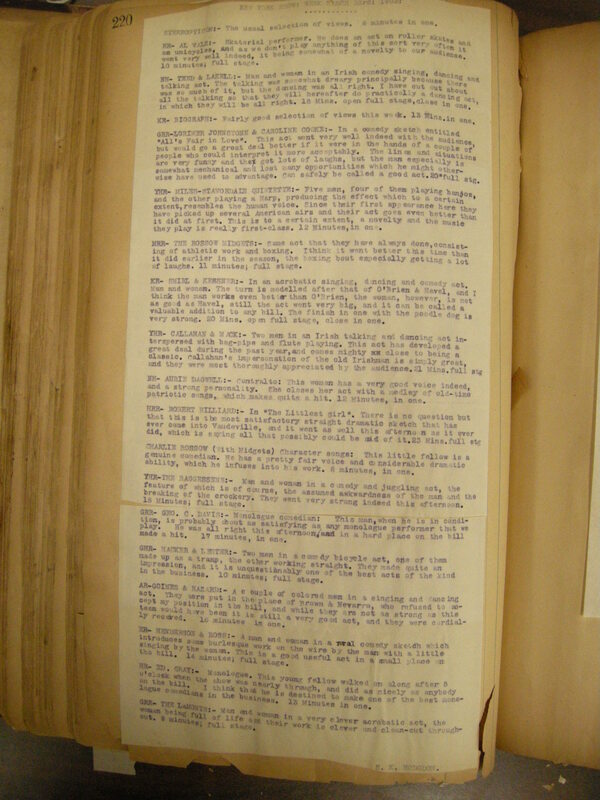 The multi-page reports have had the last page pasted along the top edge and placed low on the ledger page; the next-to-last page is then placed higher on the page, etc. Thus the top sheet can be read and lifted to expose the second sheet, the second sheet lifted to expose the third, etc. David Monod has kindly provided 12-megapixel digital photographs of two typical pages: page 1; page 2; the report text is easily read by zooming in. The reports review acts (often noting items that were censored), suggestions as to where acts should be placed on the bill, running time, and even whether the act was in one or required full use of the stage. Headline acts usually received less attention in the manager's reports than did others. The Reports are not indexed. The 64 volumes of Series II, Clipping Books collect all of the publicity materials generated by a single Providence, Rhode Island theater between 1894 and 1941. Keith's Opera House opened in the fall of 1894; it was renamed Keith's New Theatre in 1900 (and later called simply "Keith's Theatre"); renamed the E. F. Albee Theatre in 1919; and again renamed, the RKO Albee Theatre, in 1929. 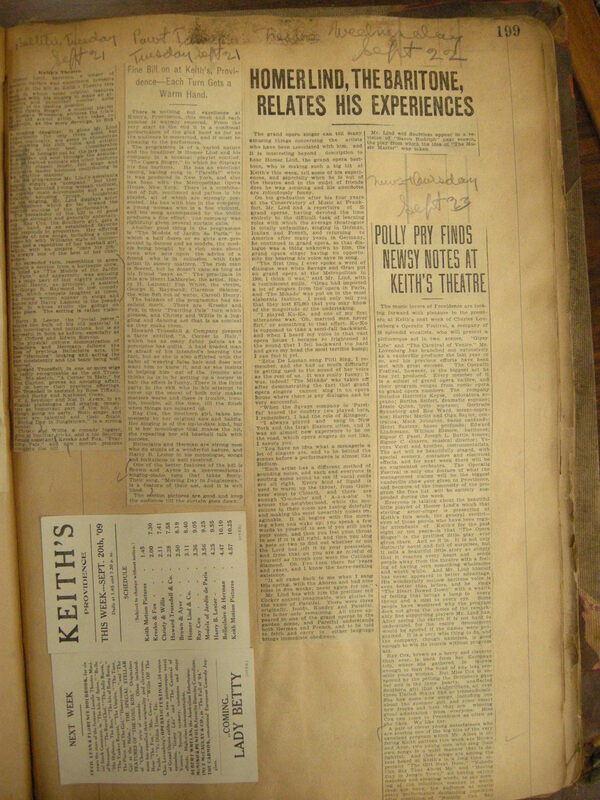 The series is essentially complete, with copies of programs, clippings, and a range of other publicity ephemera documenting Keith's vaudeville and Edward F. Albee's Stock Company pasted into ledger books in chronological order. Photographs of two pages [page 1; page 2] give an impression of the content and organization. Related to the ledger books are eight notebooks recording the names of performers booked each season 1905-1910. 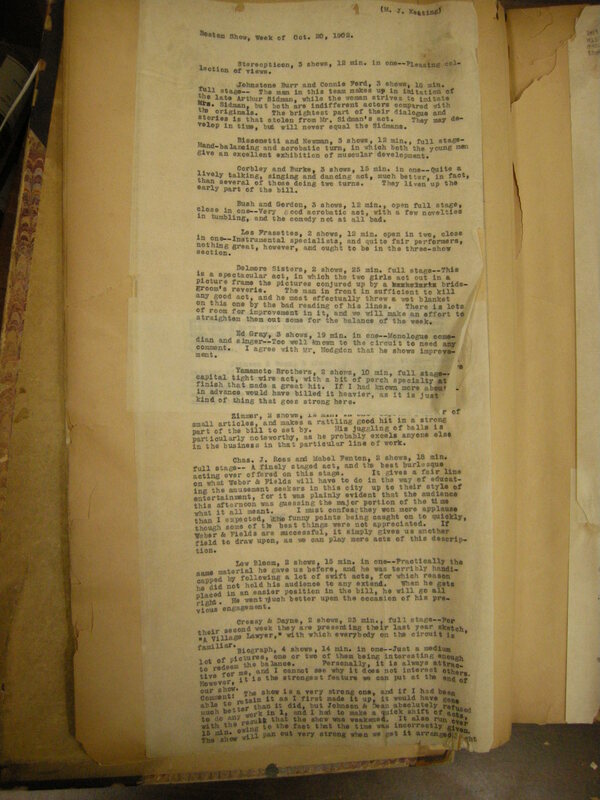 Series III contains shorter runs of 27 similar scrapbooks for other Providence theaters (the Empire; Nickel; Nickel and Bijou; and Victory) as well as nine for Pawtucket theaters (Keith's, Music Hall and Scenic; Bijou; Bijou and Star) and six for the Bijou Theatre in Woonsocket, Rhode Island). Together, the Clipping Books contain some 26,470 pages. Boxes 2 and 3 of Series VI (Financial Records) contain related materials for some of these theaters. Series IV contains another 10 scrapbooks, less closely related to specific theaters, one of which contains caricatures of performers, 1908-1911, clipped from a variety of sources. None of the Clipping Books have been indexed. Series VI, Financial Records, includes cash books (1918-1941), treasurer's statements, salary lists, and other financial records for several Rhode Island theaters and related corporate entities. Series VII, Subject Files, consists of a series of conventional file folders containing varied materials, the bulk date after 1940 and largely document operations of the RKO Albee Theatre under the management of George E. French, by this time exclusively showing films. Some of the files, such as the RKO Theatre Service Manuals that lay out job and performance expectations for theater employees from barkers and walkmen to ushers, speak to the management of theaters in interesting ways. Miscellaneous materials such as architectural dryawings and posters round out this part of the collection. A number of OVERSIZE items are stored in Map case 2: 14. Please see Historical Note above. For more information regarding the Keith/Albee Collection at The University of Iowa Libraries see M. Allison Kibler "The Keith/Albee Collection: The Vaudeville Industry, 1894-1935", Books at Iowa 56 (April 1992), pp. 7-24, and her 1994 Ph.D. dissertation from Iowa, Female varieties: gender and cultural hierarchy on the Keith vaudeville circuit, 1890-1925 (UI MAIN Library Thesis T1994 .K415), and its published version, Rank ladies: gender and cultural hierarchy in American vaudeville. Chapel Hill; London: University of North Carolina Press, c1999 (UI MAIN Library PN1968.U5 K53 1999). Robert Clyde Allen. Vaudeville and film, 1895-1915; a study in media interaction. PhD dissertation, The University of Iowa. (UI MAIN library storage T1977.A428). Also Horrible prettiness: burlesque and American culture. Chapel Hill: University of North Carolina Press, 1991. (UI MAIN Library PN 1948.U6A45 1991). Rick Altman. Silent Film Sound. New York: Columbia University Press, 2004. (UI MAIN Library PN 1995.75 .A44 2004). Digitized scrapbooks from this collection (currently in process) can be viewed on the Iowa Digital Library. EAD finding aid derived from HTML document. Encoded by Jane Monson, April 2008. Keith/Albee Collection, The University of Iowa Libraries, Iowa City, Iowa. http://aspace.lib.uiowa.edu/repositories/2/resources/2 Accessed April 20, 2019.